GE’s GEnx-1B engine powered the Boeing 787 Dreamliner that set world records for speed and distance for the aircraft’s weight class. The 787, ZA006, aircraft powered by GE’s GEnx-1B engines departed Boeing Field in Seattle at 11:02 a.m. on December 6 and set the distance record for its class (440,000-550,000 lbs.) with a 10,710 nautical mile (nmi) flight to Dhaka, Bangladesh, with credit for 10,337 nmi (19,144 km). This record had previously been held by the Airbus A330 based on a 9,127 nmi (16,903 km) flight in 2002. After a two-hour stop for refueling in Dhaka, the aircraft returned to Seattle on a 9,734 nmi (18,027 km) flight. The aircraft landed at 5:29 a.m. on December 8, setting a new record for speed around the world eastbound with a total trip time of 42 hours and 27 minutes. There was no previous around-the-world speed record for this weight class. Flight routing on the first segment of the journey took the airplane from Seattle across the U.S. to Nantucket. After crossing the Atlantic Ocean, the aircraft entered European air space at Santiago, Spain, and proceeded down the Mediterranean, across Egypt and Luxor, across the Middle East and over India to Bangladesh. On the second segment, the Dreamliner flew over Singapore, the Philippines and Guam before entering U.S. airspace over Honolulu and returning to Seattle. Based on proven GE90 architecture, the GEnx engine succeeds GE’s CF6 engine. Compared to the CF6 engine, the GEnx will offer up to 15 percent improved fuel efficiency, which translates to 15 percent less CO2. The GEnx’s innovative twin-annular pre-swirl (TAPS) combustor dramatically reduces NOx gases as much as 55 percent below today’s regulatory limits and other regulated gases as much as 90 percent. 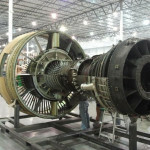 Based on the ratio of decibels to pounds of thrust, the GEnx is the quietest engine GE has produced due to the large, more efficient fan blades that operate at slower tip speed, resulting in about 30 percent lower noise levels. The GEnx is the world’s only jet engine with both a front fan case and fan blades made of carbon fiber composites.